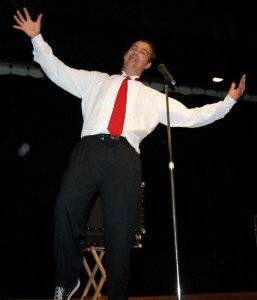 Gordon specializes in clean, hilarious comedy magic that is perfect for groups of all types. Whether he is performing his Stand-up Comedy Magic Show filled with lots of laughs, mind-blowing magic, and a bit up pick pocketing, or mingling around the crowd performing magic that is up close, and happens in your guests hands. Gordon’s goal is to make you look good and make your event a huge success! This show works for groups of 50 or more. Perfect for Holiday parties, family functions, and award ceremonies. Gordon’s show is loaded with Comedy magic and loads of audience participation and live animals. You can add 45 minutes of strolling magic to this performance before your meal to help set the tone for the fun to come later. Great for private parties, grand openings, and special events! This magic is performed inches away from the audience, and sometimes in their hands. Gordon strolls through the crowds and demonstrates his magic with cards, coins, and borrowed objects while surrounded by the audience. What others are saying about Gordon’s show. President, Allen Electric Supply Co.
Gordon Russ was especially well received at this years party. Gordon’s close-up magic performed while strolling during the cocktail hour, and his after dinner performance were both thoroughly enjoyed by everyone. Gordon definitely added to the festivities. All were amazed by your outstanding abilities in magic. Our attendees definitely enjoyed your performance and were commenting on your magic throughout the remainder of our event. ASI would highly recommended you to another company that is looking for a professional act that can amaze and entertain their employees, customers, or clients. Thank you for performing at our Bowling Awards Banquet. Everyone present truly enjoyed your performance. I had numerous come to me, and compliment the entertainment. The Grosse Pointe Yacht Club voted the finest private club in the cub in the country, and having you here was enjoyable.